"I feel like we struck gold with your teachers. They are SO caring, nurturing and wonderful with the children. I wish they could always be his teachers." Conservative Jewish traditions, values and rituals are interwoven into the program. 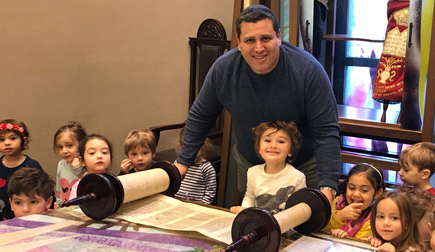 Adath Israel Nursery School is a place where children are valued, respected and where positive self-esteem is fostered in order for each child to develop at his/her own pace. We believe that the preschool years are a time when the foundation is laid for the learning years ahead. The preschool years are a time when playing and learning go hand-in-hand. We view the child as competent, capable, curious and rich in potential. We consider the staff, parents and children as partners in education. We follow an emergent developmentally appropriate curriculum as set forth by the Ministry of Education that involves a balance of teacher directed and child directed activities. The classrooms include a variety of centers for exploration: art, blocks, drama, music, reading readiness, manipulative activities, science and gym. Special projects are also incorporated into the program. We are a qualified, fun-loving and professional group of B.Ed. and ECE teachers and assistants. Our staff are carefully chosen for their commitment and understanding of curriculum pedagogy and child development. Continuous professional development ensures that we remain aware of the needs of our families and alert to current research and guidelines. Our teacher/student ratio is a maximum of 1:5 [pre-nursery] and 1:8 [nursery]. In order to assess the impact of our program on children and their families and to deliver an emergent, developmentally appropriate curriculum as set forth by the Ministry of Education. Staff development is ongoing. Instruction is given by the program supervisor which provides pedagogical direction and examples that staff can refer to as they think about and plan how to act on the goals for children. Critical reflection and collaborative inquiry are used as a means to question theory and practice, discuss ideas, test theories and share learning.